Be the first to share your favorite memory, photo or story of Betty Jean. This memorial page is dedicated for family, friends and future generations to celebrate the life of their loved one. 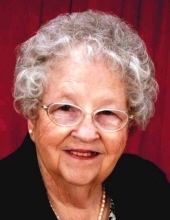 NEW ZION - Betty Jean Parker Cantey, 89, of New Zion, SC and more recently of Charlotte, NC, passed away suddenly but peacefully on Thursday, February 7, 2019, at Brookdale Carriage Club in Charlotte. On the morning of her death, her Bible was turned to Psalm 100. She has truly entered God’s gates with thanksgiving and His courts with praises. Mrs. Cantey was born fourth of six children on Feb. 4, 1930, in Winston-Salem, NC, to Mary Letticia Mouzon Parker and William Vance Parker. In addition to her parents, she was preceded in death by her husband and love of her life, Shelby Gordon Cantey, February 1, 1998. They were married October 19, 1948. Also preceding Mrs. Cantey in death were her daughter, Gayle Cantey King; brothers, William Vance Parker, Jr., David B. Parker and Cecil M. Parker; and a sister, Mary Lois Parker Johnson. Mrs. Cantey grew up in the Mouzon Community of Williamsburg County and graduated from the Williamsburg County schools. She was a proficient bookkeeper and worked beside her husband for over 20 years at Palmetto Farm Supply in Manning, SC, where her husband served as manager and an employee of Royster Fertilizer Company. She was active in the Oakdale Community in Clarendon County and was a long-time member of Midway Evangelical Presbyterian Church, where she served as former church historian and elder until 2003 when she moved to Charlotte, NC, to be closer to family following a stroke. Survivors include her son, Dr. Larry Daniel Cantey (Pamela) of Charlotte, NC; a sister, Frances Rose (James) of Newton, NC; a son-in-law, Glenn King (Cecile) of Columbia; three grandchildren, Lisa Caldwell (Doug) of Denver, CO, Daniel Cantey (Drue) of Milan, TN and Stacey Howell (Adam) of Charlotte, NC; and eleven great-grandchildren. Services celebrating Mrs. Cantey’s life will be conducted at 11:30 a.m. on Monday, February 11, 2019, at Midway Evangelical Presbyterian Church, 9600 Black River Road, New Zion, with Pastor Mike Lowder officiating. Burial will follow in the church cemetery. Pallbearers will be Tim Baylor, Matt Evans, Sheldon Evans, Brian Harrington, Jerry Harrington and Irwin McIntosh. Visitation will be held from 5 to 7 p.m. on Sunday, February 10, 2019, at Stephens Funeral Home, 304 N. Church Street, Manning. In lieu of flowers, memorials may be sent to Midway Evangelical Presbyterian Church Cemetery Fund, c/o Wendell Robinson, 1215 Evans Road, New Zion, SC 29111. A second memorial service for Mrs. Cantey will be held at a later date at Brookdale Carriage Club in Charlotte, NC. To send flowers or a remembrance gift to the family of Betty Jean Parker Cantey, please visit our Tribute Store. "Email Address" would like to share the life celebration of Betty Jean Parker Cantey. Click on the "link" to go to share a favorite memory or leave a condolence message for the family.